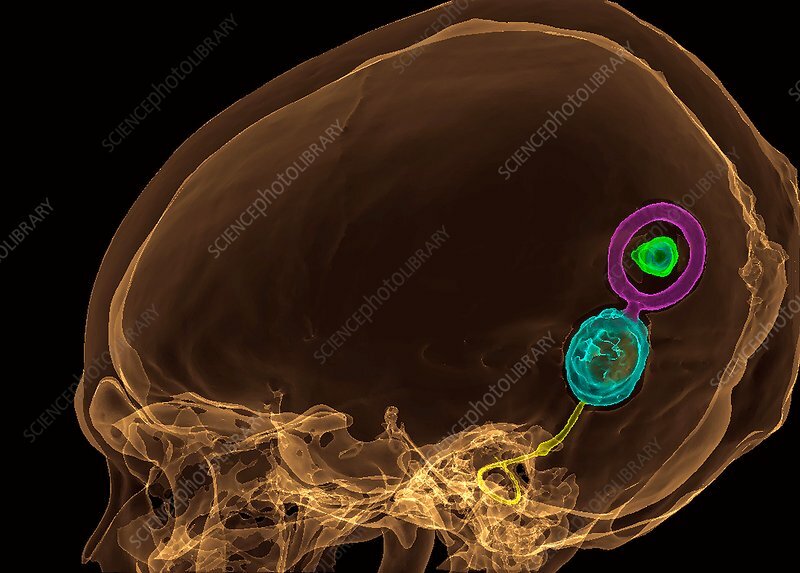 Cochlear implant, 3D coloured computed tomography (CT) scan. This device is implanted in the scalp, connected to the ear and the brain. The external component (microphone and sound processor) is worn on the ear. Alead takes the sound to the transmitter part of the device, which is magnetically bound to the internal component which has been surgically placed on the skull under the skin (pink, blue and green areas). The internal component converts the sound signal into electrical impulses sent to electrodes (yellow) implanted in the cochlea, the organ of hearing, allowing those with hearing losses to regain a sense of hearing.